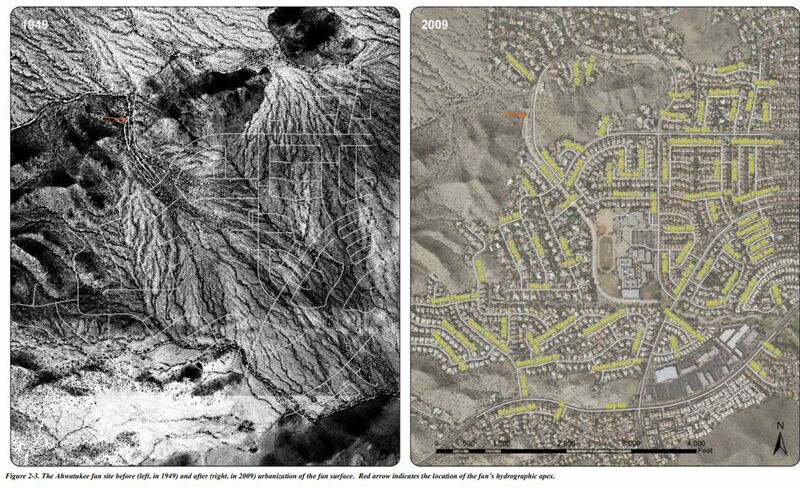 The Arizona Geological Survey has made available for free download an new report on alluvial fans near the Phoenix area. The report shows how development on the fans fared. The full report may be downloaded here. The report contains many photos from pre-development through developed stage. 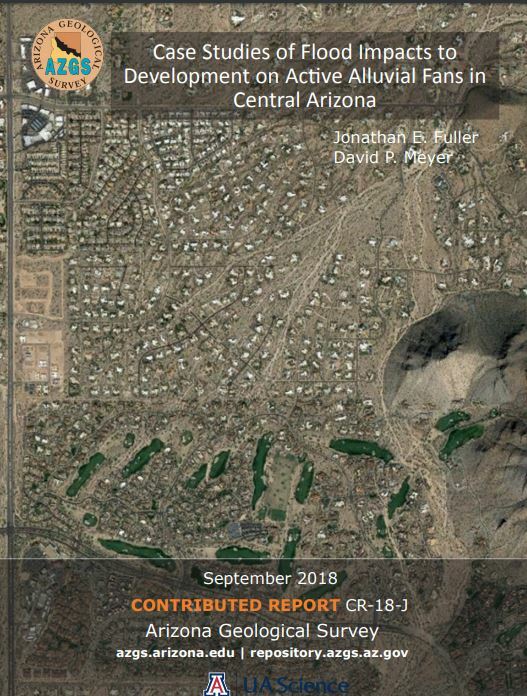 Flooding issues and drainage problems associated with historical development on four active alluvial fan study sites in central Arizona were examined to document the effectiveness of engineered flood protection measures and floodplain management policies. The study sites are located in the metropolitan Phoenix area and include (1) Ahwatukee-City of Phoenix, (2) Pima Canyon-City of Phoenix/Guadalupe, (3) Reata Pass-Scottsdale, and (4) Lost Dog-Scottsdale. The four study sites have experienced different types of urbanization, including master-planned communities, single lot residential development, public transportation and utility networks, and major engineered drainage structures such as channels, detention basins, culverts, and dams. The engineered drainage systems at the four historical alluvial fan study sites have performed adequately during the 30-year period of record, at least with respect to controlling the flow path uncertainty and sedimentation normally associated with active alluvial fans. Significantly, no homes have been damaged by alluvial fan flooding at any of the study sites, and no avulsions* have occurred in the developed portions of the alluvial fans. Two floods exceeding the 100-year design storm occurred on two of the fans, but many of the flood control measures on the other fan sites remain untested by large floods. The absence of flood damages is likely due to lack of debris flow potential at any of the sites, low rates of sediment yield at the fan sites, channelization and encroachment that increase sediment transport off the fan surface, and to some degree, the relatively short period of record since development first occurred. *Avulsions: An abrupt change in the course of a stream that forms the boundary between two parcels of land resulting in the loss of part of the land of one landowner and a consequent increase in the land of another. Check the Article Index page for more stories of Arizona geology. Posted in Geology and tagged alluvial fans, development on September 22, 2018 by wryheat2.